I love the original Honda NSX. It was brilliant. A piece of engineering excellence that sent its global rivals running for cover. It reminded Ferrari how to build a sports car, when it looked like they'd forgotten how. I ate up the reviews as a child, and young adult. Even now, I open up old articles for a piece of that nostalgia. To me, the NSX is one of the all-time greats. I couldn't be more excited about the return of a legend. At the same time, I couldn't be more pessimistic. These are the reasons why. 1) It already feels familiar. After teasing it on a regular basis as a "concept" for several years, there was no wow-factor when the covers came off. Sure, there have been some tweaks here and there, and it still looks brilliant. But who cares about the NSX production car that basically looks like a three year-old concept, when there's a brand-new Ford GT across the hall? 2) The game has changed. Ferrari has consistently been bringing their A-game since the 355, Porsche's seminal 911 has become an even better all-rounder over the years, Lamborghini now makes a second-generation junior supercar, as does McLaren. BMW offers a stunning technological masterpiece with the i8, and let's not forget that Audi builds what many consider to be the NSX's spiritual successor, the R8. A lot has changed since the NSX went away. The brilliant, original NSX was like a full-strength Manchester United playing against second division teams. This is the Premier League, and Honda is the weakened team trying to kick-start their renaissance. 3) They called it the NSX. This may be the biggest problem Honda has on its hands right now. The NSX wasn't merely a good performance car, it was a legend. How do you bring a legend back to life? The original NSX brought a knife to a gunfight and won. Then it kept winning, because even if it was under-powered (I'm clearly a fan of under-powered, Japanese sports cars), it was about the feel. The NSX just felt right. There are so many stories of greatness, and fond memories that go along with the name, that anything less than a giant-slaying performance will be a disappointment. The NSX cannot just be a good car. It must trade blows with the best cars in class, if not obliterate them entirely. 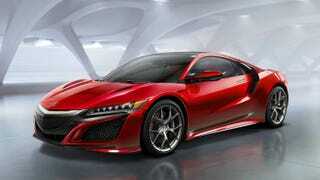 Honda has the unenviable task of re-establishing the NSX nameplate in the realm of performance motoring. They've thrown everything at the NSX, and rightly so, it needs to be epic (in the truest sense of the word). As a long-time NSX fan, I want to believe. I want to believe that this is Honda at its best, churning out engineering masterpieces for the real drivers, not the poseurs. Cars that come out of left-field and hunt-down Ferraris and Porsches, then send them back to the drawing board. But let's not kid ourselves here. It's been a while for Honda, and all the while its rivals have been going from strength to strength, as if to ensure there will be never be another NSX moment for them. Right now, it all feels a bit like Michael Jordan's third comeback. Maybe they should've just called it something else, or maybe they already know it's THAT good. Just like the last time.